Millions Sign Onto Call for Electoral College to Award the Presidency to Popular Vote Winner Clinton | Democracy Now! The 2016 Democratic presidential nominee Hillary Clinton leads the popular vote by hundreds of thousands of ballots, but she lost the Electoral College to Republican Donald Trump. The last time this type of outcome occurred was in the 2000 Bush vs. Gore presidential race. Meanwhile, electoral reform initiatives are underway to get states to adopt the National Popular Vote bill. The legislation could transform the way we elect the president of the United States. Under the compact for a national popular vote, states across the country have pledged to award their electoral votes to the presidential candidate who wins the nationwide popular vote. If enough states sign on, it would guarantee the presidency goes to the candidate who wins the most votes across the country. The compact will kick in only when enough states have signed on to reach a threshold of 270 electoral votes. We are joined by John Koza, chair of National Popular Vote. 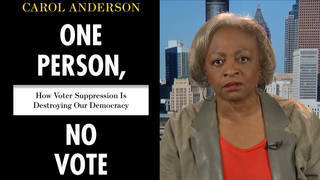 AMY GOODMAN: Well, we’re going to continue to look at what the votes break down as they come out, but we’re going to start off by looking at the fact that the loser won. AMY GOODMAN: Meanwhile, Lady Gaga has urged people to sign a petition titled “Electoral College: Make Hillary Clinton President on December 19.” It calls on the electors to ignore the current rules, which bind them to voting for the winner of their state, and cast their ballots instead for the winner of the popular vote, Hillary Clinton. The electors will meet next month. So far, more than 2 million people have signed the petition. Meanwhile, electoral reform initiatives are underway to get states to adopt the National Popular Vote bill. On Monday, New York Governor Andrew Cuomo signed legislation that recommits New York to the compact past its 2018 expiration date. The legislation could transform the way we elect the president of the United States. Under the compact for a national popular vote, states across the country have pledged to award their electoral votes to the presidential candidate who wins the nationwide popular vote, not their state. If enough states sign on, it would guarantee the presidency goes to the candidate who wins the most votes across the country. The compact will kick in only when enough states have signed on to reach a threshold of 270 electoral votes. It would prevent scenarios like what happened on Tuesday between Clinton and Trump, and in 2000, when Al Gore won the popular vote but still lost the election to George W. Bush. Well, for more, we’re going to Stanford, California, where we’re joined by John Koza, chair of National Popular Vote, consulting professor at Stanford University in computer science and electrical engineering. Koza is the former CEO of Scientific Games. Welcome to Democracy Now!, John. Can you please explain what has happened? A lot of people, I think, are scratching their heads. I still don’t think most people understand the Electoral College. What do you mean Hillary Clinton is winning by hundreds of thousands of votes right now—of course, all the votes haven’t been counted—but she still lost? JOHN KOZA: Well, thank you, Amy. The problem comes from state laws that award all of the state’s electoral votes to the candidate who gets the most popular votes inside each particular state. So the fact that Donald Trump got 1 percent more of the popular vote in Pennsylvania and Wisconsin and Michigan meant that he got all of those electoral votes, and that constitutes his winning margin in the Electoral College, even though he’s behind in the nationwide popular vote among the people of all 50 states. AMY GOODMAN: Explain how the Electoral College votes. And this call Lady Gaga is making, explain what it is she’s calling for electors to do and who these electors are, who will not exactly personally meet, but will cast their votes in December. JOHN KOZA: Well, the electors are generally activists of their political party. So, Donald Trump, at the moment, is going to get at least 279 of the 538 electors. Those 279 people are active Republicans, either officeholders, former officeholders, party officials, maybe donors—people who are very devoted to the Republican Party. And there’s very little history that indicates that any more than zero or one of these 279 electors would ever deviate from their party’s nominee. So, when the Electoral College meets on December 19th, Donald Trump will probably get 100 percent of the 279 Republicans who are committed to vote for him. JUAN GONZÁLEZ: Well, isn’t it possible, given the reality that the Electoral College basically prejudices the smaller states, because every state has at least two senators, and some of them just have one congressman or two congressmen, versus California, New York or the others, so they always have a disproportionate share—isn’t it possible that we may be entering an era of more of this, because we’re now facing the fact that six out of the eight last presidential elections were won—the Democrats won the popular vote, but they won only four of the eight actual Electoral College votes now; we’ve had two of these now over the last couple of decades—and given the increasing concentration of populations in some of these big states, that we may be facing more of this in presidential elections to come? JOHN KOZA: Well, we’re definitely going to have more of this, because we’re in an era of relatively close presidential elections. In the last eight consecutive elections, the average nationwide margin has been 5 percent or less. So, we can expect, if that trend continues, to see the Electoral College producing a different winner than the national popular vote. And that, I think, is a fairly safe prediction. AMY GOODMAN: I want to clarify, when I talked about Lady Gaga, she was just retweeting a petition at Change.org that was calling for this change. Now, what happens in December? People—how do they meet? They don’t physically meet, right, Professor Koza? JOHN KOZA: They do physically meet up. They go to their state capitols. So, the 20 Trump electors that were elected Tuesday in Pennsylvania will all go to Harrisburg, and they will all dutifully cast their personal electoral vote for Donald Trump. And he’ll end up with 279 of the 538 electors, and therefore he’ll become president. AMY GOODMAN: But they don’t all meet together from all over the country. So explain how the Electoral College came into place, and talk about what you are advocating for, National Popular Vote. JOHN KOZA: Well, the Electoral College is probably outdated. It certainly is not what the founders intended. They intended an aristocratic group, small group of noblemen, basically, who would wisely decide who the president is. That went out the window in 1796 in the nation’s first competitive presidential election. The problem we have with the Electoral College is not the existence of the Electoral College. It’s the state winner-take-all laws that give all of a state’s electors to the candidate who gets a bare plurality of the vote inside that particular state. So the fact that Trump carried Pennsylvania, Wisconsin and Michigan by a hair, even though he was losing the people’s vote across the country in all 50 states, meant that—means that he gets all of the electors from those three states. Now, under the National Popular Vote proposal, which is now law in 11 states, those states, when we have enough states that have a majority of the electors—that is, 270—those laws go into effect. And they will award all of those electors to the candidate who gets the most popular votes in all 50 states. And that’s what would guarantee the White House to the candidate who gets the most popular votes in all 50 states. Now, this legislation is already law in 11 states, having 165 electoral votes. It needs states with 105 more electoral votes to become law in time for the 2020 election. JUAN GONZÁLEZ: And, John Koza, what states do you see as most likely or the most fertile area to be able to reach that 105 target now that you need? JOHN KOZA: Well, in the last few years, this proposal has been—has become quite bipartisan. So, for example, the latest state legislative chamber to pass this proposal was the Arizona House, where two-thirds of the Republicans and two-thirds of the Democrats sponsored the bill. It also passed recently in the Oklahoma Senate and—excuse me—the Republican-controlled New York Senate. So, in the last couple of years, there’s been increasing bipartisan support from both parties to change the system. And the real motivation for the change was not primarily this issue of whether the candidate with fewer votes ends up in the White House, although that’s very, very important, obviously, but the fact that most of the states are ignored in the presidential campaign. Virtually all of the presidential campaign that ended Tuesday was conducted in just 12 states. And that was the same in 2012. A hundred percent of the campaign events in 2012 after the nominating conventions were in just 12 states. Governor Walker put it very bluntly about a year ago when he said the nation, as a whole, is not going to elect the next president, 12 states are. So, one of—the biggest single problem with the current system is that most of the country is really politically irrelevant in selecting the president. Then, on top of it, when the 12 states that matter vote, the candidate who gets fewer popular votes nationwide can end up president. So, all in all, it’s an entirely bad system, but it’s a system that is based solely on state law and can be changed by changing these state laws. AMY GOODMAN: Finally, John Koza, what are you advocating for right now? JOHN KOZA: We would like to see people contact their state legislators—these are the people that the Constitution gives the power to determine the method of electing the president—to get state legislators to get their state to sign on to the National Popular Vote bill. AMY GOODMAN: John Koza, we want to thank you very much for being with us, chair of National Popular Vote, consulting professor at Stanford University in computer science and electrical engineering. This is Democracy Now! When we come back, how are people organizing right now around the country? Stay with us. AMY GOODMAN: “Democracy” by Leonard Cohen. The great singer-songwriter died at his home in Los Angeles at the age of 82. I last saw him live at Radio City Music Hall in 2013, just an astonishing performance. This is Democracy Now!, democracynow.org, The War and Peace Report. I’m Amy Goodman, with Juan González.